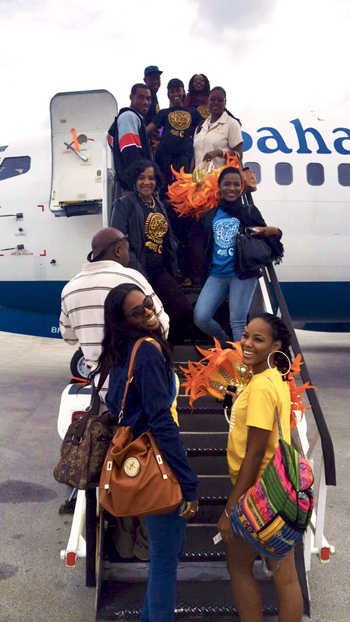 ALL ABOARD – ‘The Grand Life’ Team left Grand Bahama on Monday and is on the ground in New Providence ready for Bahamas Junkanoo Carnival which is scheduled to take place May 7-9. The momentum has been building for months to what is touted to be the largest cultural street festival in the country to date, come May 7-9, 2015. Hot on the heels of a successful kick-off weekend in Grand Bahama, the nation’s second city, on April 17th and 18th, which drew more than 30,000 spectators to Taino Beach, organizers are preparing for up to 100,000 residents and visitors during the three-day celebration. Participants will have an opportunity to become immersed in Bahamian cuisine, culture shows, arts and crafts, street parades and Rake ‘n’ Scrape music. 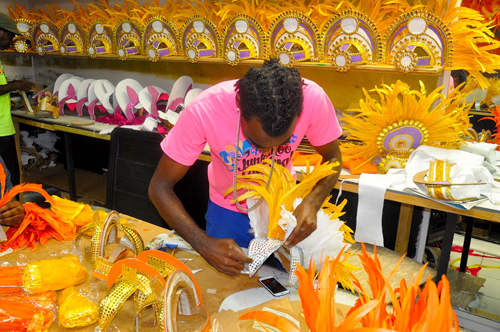 ALL SET – These gorgeous costumes that have been under construction in the Grand Bahama Cultural Carnival Company Production House over the last few weeks have since been shipped over to the capital for ‘The Grand Life’ team the big reveal at Bahamas Junkanoo Carnival may 7-9. The Grand Life team has been busy in the production house over the past weeks creating costumes for the big event. Now with Bahamas Junkanoo Carnival only days away, the excitement is in the air as the team, over 200-strong, inclusive of The Grand Life models, dancers, Junkanooers, makes ready to give the rest of the world a taste of ‘The Grand Life’. Grand Bahama residents and visitors alike also witnessed a spectacular Music Masters Semi-finalist competition where 17 talented Bahamian artists went head-to-head on one stage to vie for the top 10 spots. The finalists Colyn with his two songs - Carnival is Here and Jump & Carry On; Georgina Ward-Rigby with In the Carnival; Ian McQuay with Going Home; Ericka 'Lady E' Symonette- with My Islands in the Sun; Sammi Starr with Jump in the Line; Chris ' Sketch' Carey with Wine like a Champion; BodineJohnson with All Day, All Night; Sonovia Pierre with Junkanoo Carnival Party and Tyrone Platti Dread with Junkanoo Rock now have chance to win $20,000 will perform at Music Masters in Nassau on May 8. 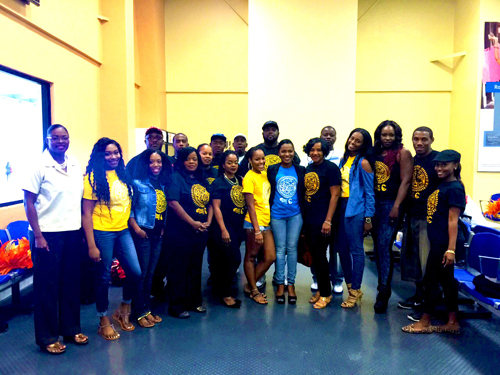 OFF TO CARNIVAL – Members of ‘The Grand Life’ Team are already in New Providence and making ready for the rest of their teammates who are hyped and poised to take part in the first ever Bahamas Junkanoo Carnival Event. “Grand Bahama showed up in a big way for the historical kick-off event a few weeks ago and I have every confidence that we will make an impressive showing when Bahamas Junkanoo Carnival takes centre stage later this week," said Ginger Moxey, Bahamas Junkanoo Carnival Grand Bahama event organizer. Along with the IAAF World Relays, which was staged for the second year in Nassau over the weekend, Bahamas Junkanoo Carnival is also expected to position The Bahamas’ rich culture at a new level on the world stage and inject a steady economic boost to the country. It all starts on Thursday, May 7 with JunkaMania – the biggest Junkanoo stage in the world – showcasing Junkanoo music and other Junkanoo-inspired folk forms. The finals of the Music Masters song competition will take place on Friday, May 8, followed by Midnight Rush, and Saturday, May 9 will bring the highly anticipated ‘Road Fever’ parade, where ‘The Grand Life’ Group will participate, and a close-out concert. For more information visit www.bahamasjunkanoocarnival.com.